5 pounds of raw fresh frozen Gulf shrimp, perfect for any party - size 21/25. 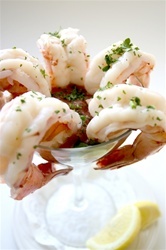 Our shrimps are head-off, firm in texture and tasty. Shrimps this size aren't found in stores. They make excellent shrimp cocktails, grilling or sauteed. We sell many to high end restaurants across the country.